Fabio Jakobsen (Deceuninck-Quick-Step) took the bunch sprint at a windy Scheldeprijs, Wednesday. He benefited from a strong leadout and escaped being boxed in during the final 200 meters to beat Maximilian Walscheid (Team Sunweb) and Chris Lawless (Team Sky) to second and third respectively. Sandwiched between the Tour of Flanders and Paris-Roubaix, Scheldeprijs has an altogether different nature, being pan-flat and containing only a few sections of largely benign cobbles. The 202-kilometer race spends a lot of time in the Netherlands before crossing back into Belgium and finishing in Schoten. The major difficulty of the race is the exposed roads of the area. As in the 2018 edition, the race action was largely dictated by strong crosswinds, with splits in the peloton forming as early as 40km into the racing. Early in the race, a large group of around 40 went clear and soon took over one minute on the peloton. Throughout the race, echelons and splits formed and re-formed numerous times, with EF-Education First, Deceuninck-Quick-Step, and Trek-Segafredo all taking their turn to kick off the havoc. With 30km to go and the race on the finishing circuits, Katusha-Alpecin came to the front to dictate the pace, looking to set up Marcel Kittel, who has won five of the last seven editions. The race was now all back together except for two men in the break. However, having missed his opportunity in the 2018 edition of race with a late puncture, the German sprinter was again taken out of contention with 17km to go. A touch of wheels towards the back of the group took out a number of riders. With 12km to go, and the breakaway caught, Edvald Boasson Hagen (Dimension Data) launched a late flyer out of the bunch, and was briefly joined by Lionel Taminiaux (Wallonie-Bruxelles). However, a sprint finish was all-but-certain with the pace being set by Quick-Step in the peloton behind, and the pair were soon neutralized. 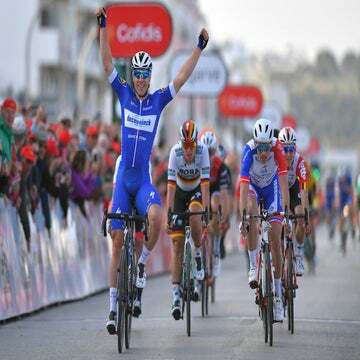 In the closing stretch, Quick-Step perfectly maneuvered 22-year-old Jakobsen into position, with Florian Senechal navigating his teammate through the packed field. Marco Haller, Katusha-Alpecin’s second sprinter, jumped first. However, Jakobsen was able to come around the back of four riders, including Lawless and Walscheid, having been boxed in, and kicked hard to outpace Haller. Walscheid was able to latch on to Jakobsen’s wheel just long enough to take second, while Lawless took his second-consecutive third place in the race.